Almost 50% of people that visit landing pages from emails will abandon the site in the first eight seconds, meaning a lot of the effort marketers make to get people to click on links in emails is wasted. Silverpop’s latest email study, ‘8 Seconds to Capture Attention’ (registration required) looks into what makes an effective email landing page by studying the landing pages from the campaigns of 150 companies. The main thrust of the report is that, from clicking the link to purchase or registration, the customer’s path should be smooth, and without too many distractions. The report found that many landing pages contained diversions and barriers to converting customers. The study found that 45% of landing pages didn’t repeat the email’s call to action. Repeating the email’s message on a dedicated landing page will help reinforce the conversion. It is best not to dump customers at your home page and make them wander round the site looking for the relevant section. Instead, email links should lead to a landing page which is relevant to the content of the email, whether this is a specially created page, or a related section of the website. Eighty three percent of the companies evaluated in the study put this into practice. This is another way of reinforcing the conversion goal - matching the look and feel of the email will reassure the customer. Thirty five percent of landing pages studied didn’t match the look of the email. If you have to ask for customer data on the landing page, make it clear why you need this information. Companies surveyed typically attempted to collect as much data as possible - 42% of forms included more than 10 fields to complete, while 32% had more than six. This can lead to customers becoming frustrated and abandoning the process. 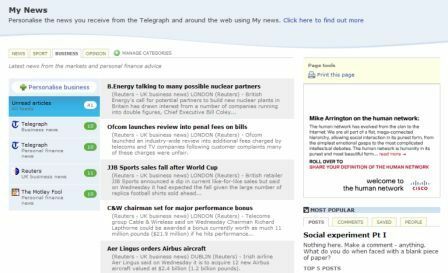 The Telegraph has added a new feature to its MyTelegraph section – an RSS reader that gives the paper’s online readers a chance to read other news sources without having to leave the site. 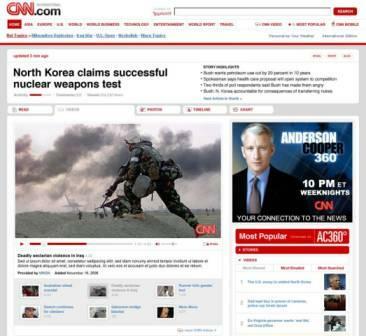 CNN is planning to relaunch its main news site in July with a major redesign and a number of Web 2.0 features, extending the site’s choice of video and user-generated content. Manchester United is looking for a strategic partnership with a marketing group in a push to build the club’s online fan base to 50m worldwide. According to The Guardian, Man Utd is in talks with WPP, Publicis, Omnicom and McCann Worldgroup over the scheme.